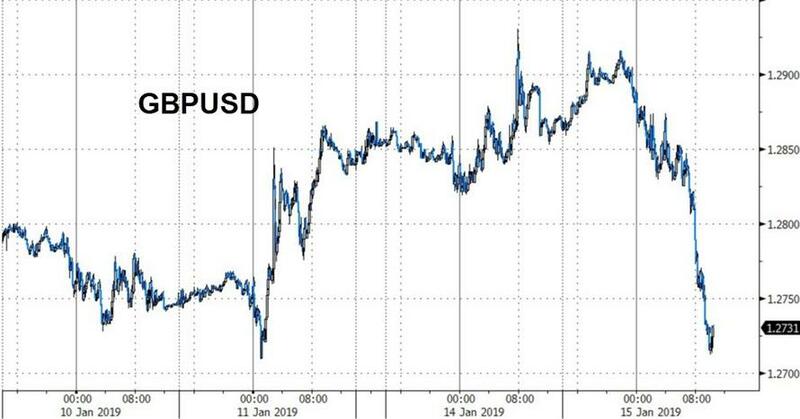 Update 10: After trending steadily lower ahead of the vote, the pound roared into the green as the Commons adjourned for the day, as traders realized that analysts who had warned about a spectacular defeat of May's deal being good for the pound may have been on to something. With hundreds of Labour MPs preparing to pivot toward a second referendum this week, it appears more of Jeremy Corbyn's positions are being foisted upon May as she scrambles to figure out what's next for her deal. And even May's own cabinet is expected to pressure her to change course and advocate for staying within the customs union - something that is anathema to hard Brexiteers. Government sources say she will now come under 'huge pressure' to tack to a Customs Union - both from within her Cabinet and and without. 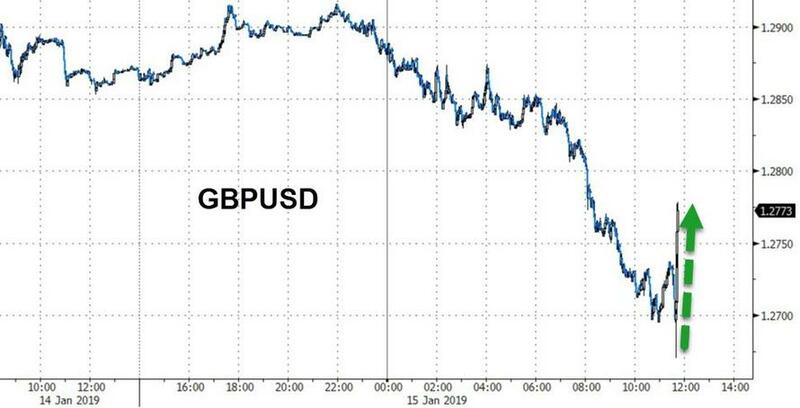 And in a potential threat to the pound and May's government, Labour has indicated that it will try again if it loses the no confidence vote against May tomorrow. Labour indicates it will try again if it fails to win the confidence vote tomorrow. So just as PM went into meaningful vote today knowing she would lose, so Labour will go into confidence vote tomorrow expecting defeat. If May loses the vote, Labour has made clear that all options - including a second referendum - are on the table. And even if she wins, May and the EU have now gotten the message loud and clear: May's deal is unworkable. If the EU refuses to compromise, a no deal Brexit is also clearly not going to work, since Parliament last week adopted an amendment to make sure such an outcome would require its explicit authorization. At this point, a delay of Article 50 is looking extremely likely, unless May can win some serious concessions from the EU. But all the bloc needs to do now is dig in its heels and refuse to budge on the deal, and there will suddenly be a strong possibility that Brexit will be killed. Though one currency strategist for TD Bank argued that it's tough to get excited about the pound since the situation is so uncertain. 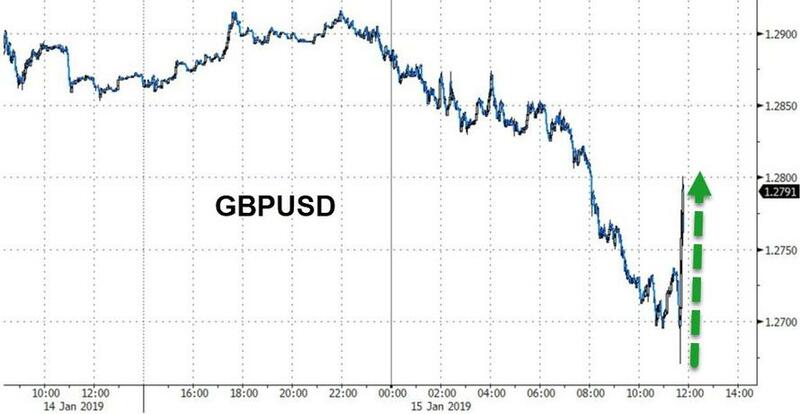 "While we have bounced since, we struggle to get excited about sterling’s upside here," said Ned Rumpeltin, European head of FX strategy at Toronto-Dominion Bank. "We could see some market participants begin to think that the next move will be in favor of a ‘No Brexit’ outcome, but there is still a lot of blue water between here and there." But one thing is for sure. If there is a Brexit, it could be even softer than the deal currently on the table, as May said after the vote that May would begin cross-party talks - possibly including Labour Jeremy Corbyn - later this week, though Corbyn was quick to reject the offer in his statement. Despite Tuesday's surge in optimism about the possibility that Brexit could be foiled, the pound remains 15% below its pre-Brexit level. 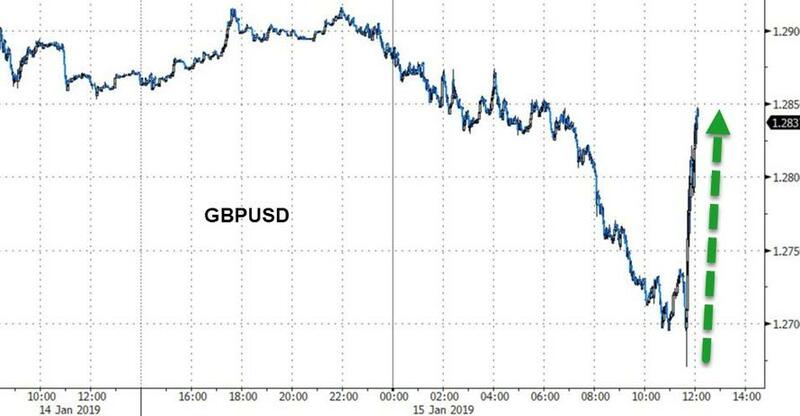 And according to a group of economists polled by Bloomberg, the best-case scenario would be another poll on whether Britain should leave the EU, which would boost the currency to $1.35. 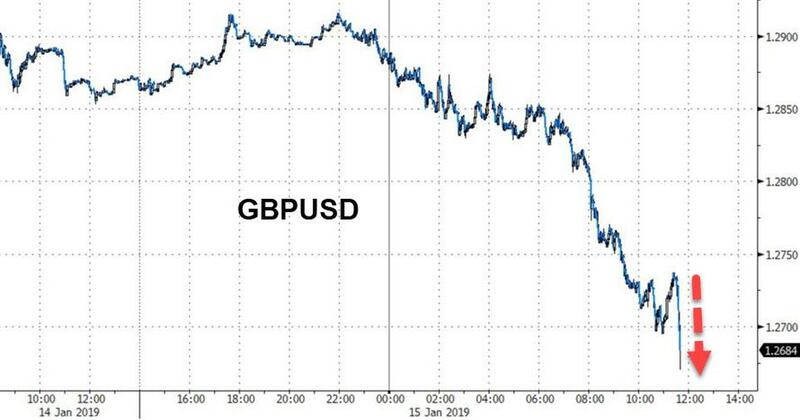 The worst case would be leaving with no deal , which could see the pound drop to $1.15. As we noted in the tweet below from European Council President Donald Tusk, the EU27 isn't thrilled about the outcome of the vote. Soon, we may see more bureaucrats hinting non-too-subtly that maybe its time for the UK to rethink the whole Brexit process, democracy be damned. Update 9: The House has adjourned for the day, and cable has continued its ascent toward the $1.2850 level. Update 8: Steve Baker, director of the Brexiteer faction in the European Research Group, has met with May to lay out what is presumably their preferred alternative to May's Brexit plan. Meanwhile, amid the chaos in the aftermath of Tuesday's vote, this quote reportedly used by Winston Churchill to mock Americans is once again being thrown around to mock the fractiousness in May's conservative party. "You can always count on them to do the right thing - after they have tried everything else." A reporter for one German newspaper, citing several EU27 sources, said they would support delaying Brexit Day until the end of June (though a recent ECJ decision granted the EU unilateral authority to do so). Update 7: In a silver lining for May, the DUP has said it will back May in Wednesday's no confidence vote, meaning that the only way for the opposition to topple the government would be for a number of Tory rebels to side with Labour which is...unlikely. After months of fractious negotiations during which Theresa May has repeatedly tried - and failed - to win over intransigent Tories and members of the small Northern Irish party upon which she depends for her tenuous Parliamentary majority, May's supremely unpopular Brexit withdrawal deal is finally coming up for a vote in the House of Commons. At least 70 members of May's party have publicly pledged to oppose the deal, and members of the Brexiteer European Research Group have also vowed to vote down each of the four proposed amendments that MPs will be decided before the deal comes up for a vote. May has just over two months to secure a withdrawal agreement palatable to both Parliament and the EU27 leaders, or risk a delay of Article 50 - which would push back the Brexit deadline - or possibly a chaotic 'no deal' outcome (though Parliament has recently taken steps to ensure that a 'no deal' exit would require the explicit approval of Parliament). UK diplomats are reportedly already working under the assumption that the March 29 "Brexit Day" will likely be delayed. Per the Wall Street Journal, four amendments to the motion to pass the deal have been selected by John Bercow, the Speaker of the House of Commons, including one that would exclude a no-deal Brexit and another that would put a time limit on the UK's transition out of the EU. Another amendment, which May has said isn't palatable to Brexiteers (or the EU) is the Leigh amendment, which would put a time limit on the backstop. In theory, the amendments would give May, Parliament and the EU a better idea of what Parliament would accept. May is expected to return to Brussels within 48 hours of Tuesday's vote to meet with EU leaders, who have recently signaled that they might be open to making some minor changes to the deal. But a stunning defeat in Parliament is seen as an essential step before this can happen. 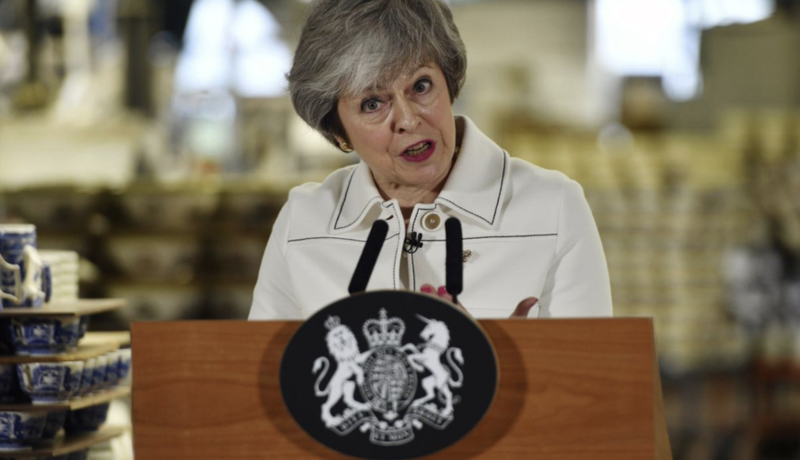 Shortly before the vote was scheduled to begin, headlines crossed the wires reporting that May would return with an even better Brexit deal next week (an amendment passed last week requires May to return with a 'Plan B' within a few days of the deal's defeat). The latest reports suggest that May's efforts to convince some Tories to abstain instead of voting against the deal have been ineffective, which suggests the deal likely will lose by a sizable margin. Labour has confirmed that it will be voting against the deal. Party leader Jeremy Corbyn has also threatened to table a motion of no-confidence in May's government if she loses the vote, saying that Labour would seek another general election. Looking beyond Tuesday's vote, Deutsche Bank tabulated the odds for various Brexit outcomes. Ultimately, a loss of 150 votes or more could increase the chances that May resigns or is pushed out following the vote (text courtesy of Deutsche Bank). A) May resignation/withdrawal of cabinet support: 20% probability. While we think this unlikely, there is a chance Prime Minister May resigns following the vote, particularly should the government's loss be toward the top end of the scale mentioned above. Another possibility is the cabinet collectively withdraw support, making her position untenable. The main reason why we see this as unlikely is that under Conservative Party rules, unless MPs can agree on a single candidate to replace the Prime Minister, a leadership contest would follow. As Conservative MPs will find it difficult to agree on a single replacement candidate, unless Prime Minister May chooses to resign, we think the cabinet will seek to avoid a de-stabilising leadership contest. Should May resign and a leadership contest materialise, we would anticipate a pro Brexit candidate to be successful. 1While this would increase the likelihood of a no deal Brexit, our base case would be that new elections result, particularly if government policy pivots towards no deal. 3) A second referendum: 15% probability. The government's policy switches to seeking a second Brexit referendum, or (more likely) MPs direct the government to call one at the vote on the 21st January or subsequently. Article 50 is extended to July, or perhaps beyond. We have slightly increased the probability of a second referendum following reports over the last few days the EU27 could envisage an extension of Article 50 beyond the EU Parliament elections in late May, and perhaps well beyond when MEPs take their seats in July. We still believe a bigger sticking point to a second Brexit vote is that while parliamentary consensus could emerge to hold one, consensus on the question asked of the electorate will be more difficult. May winning tomorrow's vote. While we had attached a probability of 40% to May securing political support for the Withdrawal Agreement last week, this was contingent on May pivoting towards a cross party approach in the meantime, which has not materialised. We now do not think there is a realistic probability of the government winning tomorrow's vote. Revocation of A50. Following a ruling from the ECJ, it is now technically possible for the UK to unilaterally revoke the Article 50 process (the UK's exit from the EU). Revoking Article 50 would carry an enormously high political price, however, and we do not see it as likely at this stage.